Paychex Named One of the World's Most Ethical Companies® by Ethisphere for the 11th Time - Paychex Inc.
ROCHESTER, N.Y., Feb. 26, 2019 /PRNewswire/ -- Paychex, Inc., a leading provider of integrated human capital management solutions for payroll, benefits, human resources, and insurance services, has been recognized by the Ethisphere Institute, a global leader in defining and advancing the standards of ethical business practices, as one of the 2019 World's Most Ethical Companies. Paychex and its employees are proud to have be recognized 11 times since the Ethisphere Institute began awarding the honor in 2007. "We believe we have a responsibility to enrich our local communities, support our employees, be good stewards of the environment, and help our clients do business – the right way," said Paychex president and chief executive officer Martin Mucci. "As a leader in our industry, our clients, employees, shareholders, and communities count on us to have the very highest ethical business practices, so to be recognized for living this fundamental value is something we're immensely proud of." According to the Ethisphere Institute, 128 honorees were recognized this year, spanning 21 countries and 50 industries. The thirteenth class of honorees profoundly illustrate how companies continue to be the driving force for improving communities, building capable and empowered workforces, and fostering corporate cultures focused on ethics and a strong sense of purpose. "Today, employees, investors, and stakeholders are putting their greatest trust in companies to take leadership on societal issues. Companies that take the long view with a purpose-based strategy are proven to not only outperform but last," said Ethisphere's chief executive officer, Timothy Erblich. "I congratulate everyone at Paychex for earning this recognition." The World's Most Ethical Companies assessment is based upon the Ethisphere Institute's Ethics Quotient® (EQ) framework, which offers a quantitative way to assess a company's performance in an objective, consistent and standardized manner. The information collected provides a comprehensive sampling of definitive criteria of core competencies rather than all aspects of corporate governance, risk, sustainability, compliance, and ethics. 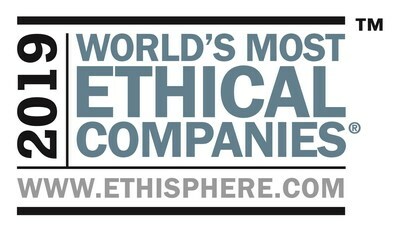 The full list of the 2019 World's Most Ethical Companies can be found at https://worldsmostethicalcompanies.com/honorees. Best practices and insights from the 2019 honorees will be released in a report and webcast in March and April of this year. Sign up to receive the report. The Ethisphere Institute® is the global leader in defining and advancing the standards of ethical business practices that fuel corporate character, marketplace trust, and business success. Ethisphere has deep expertise in measuring and defining core ethics standards using date-driven insights that help companies enhance corporate character and measure and improve culture. Ethisphere honors superior achievement through its World's Most Ethical Companies recognition program and provides a community of industry experts with the Business Ethics Leadership Alliance (BELA). More information about Ethisphere can be found at https://ethisphere.com.